Every organization wants a reputation as a great place to work. In many fields, the workplace has become a candidate’s market where the best people have their pick of jobs. And it’s not enough to attract and hire top people—you have to be able to retain them too. Being known as an organization where the best people want to work isn’t just an HR issue—it brings a serious competitive advantage when the best people want to be part of your team. But it doesn’t just happen by chance. Great leadership. People are attracted to leaders who are inspirational, supportive and empowering. Supervisors and managers are sometimes unaware of the role their actions and decisions have on employee turnover, so manager training and leadership awareness are a must. Managers need the skills, the tools, the knowledge and the inspiration to keep employees engaged. When you get leadership right, you get the right people. Great jobs. Getting people to join your workforce won’t be a problem if the job is attractive and challenging. But to retain your best people, you have to provide room for advancement with a career path and meaningful professional development. If you fall short in this area, you’ll lose employees to organizations that do better—which in turn will harm your reputation with prospective employees. Great culture. People are more committed and engaged when they can contribute their talents and ideas. A sense of ownership and respect makes employees feel they can excel. Creating a culture that nourishes top talent, encouraging creativity and risk and avoiding petty rules, is among the best ways to keep and attract the best people. Great purpose. Millennial’s now entering the workforce need to understand the why, not just the what. They want to understand and connect with an organization’s mission; they want to know how their work benefits that mission. You need to make sure you have a clearly expressed mission that resonates with people, and an organization that lives out that mission with authenticity and consistency at every level. Great development. The best workplaces make training and development part of their culture. A solid professional development program is one of the best recruitment tools you can develop. The investment of time and money will yield massive dividends in workforce security and the resulting benefits. Great rewards. It goes without saying that your salary and benefits need to be competitive. Beyond that, you also need to make sure people feel appreciated and recognized for their efforts with external rewards like public recognition, bonuses and awards. Even more important is intrinsic motivation—feeling connected and valued, with autonomy and opportunity for development and growth. Even if you’re doing well right now in recruitment and retention, these issues are important enough to warrant a proactive approach. Make an assessment of your organization’s leadership, culture and practices that affect employees—and if you see an area that’s wanting, don’t wait to make it right. Lead from within: Being a good employer means staying aware of what it takes to attract and keep the talent that you have. Pay attention to what your people need so you can be responsive to what they want. The post How to Attract and Keep the Workforce You Need appeared first on Lolly Daskal. Workplace culture and engagement seem to be at a definite ebb—64 percent of employees in a recent study felt they didn’t have a strong work culture and 49 percent were not satisfied with their supervisor. This low engagement results in a 33 percent decrease in operating income and an 11 percent decrease in earnings growth, according to a report by TruPath. Many organizations are falling short in providing their staff what they need to succeed in the workplace. Workplace culture may sound like a trendy concern, but don’t underestimate its importance. Culture sets the stage for success. It represents the things that bring people together as well as the things that distinguish them. It’s the culture of an organization that that is the strongest reflection of its shared values, whether they’re solidly pointed toward success or careering toward failure. Create it. Great leaders build and drive great cultures. They know it is their number one priority. They know they cannot delegate the task—they must create and lead a culture of greatness. Leadership begins with the process of creation. Teach it. Too often, leaders don’t feel a need to keep their employees informed about what’s going on or show them how to succeed. Instead, they leave people to their own devices to figure it all out. If you want to have a successful culture, take the time to provide instruction and illustrations. Shape it. Cultures are constantly changing, and as a leader you must always be working to keep it in shape. A culture of greatness doesn’t happen by accident. It comes about when a leader expects greatness and each person in the organization builds it, lives it, values it, reinforces it and fights for it. Humanize it. People are at the center of every effective organizational culture. You can implement all kinds of processes and procedures, you can set up mental models and theory-driven systems, but at the end of the day if your culture isn’t humanized you’re missing the mark. Support it. Cultures that thrive have the support of the organization’s leadership in addition to that of ambassadors throughout the organization who believe in what is being accomplished. No culture can succeed without widespread buy-in and support. Trust it. If you trust your vision and direction and take ownership of them, others will trust and take responsibility themselves. When everyone holds themselves accountable, you have an organization based on trust—and trust is the cornerstone of any healthy culture. Respect it. The undercurrent of any sound organizational culture must be one of respect. People who respect one another behave with courtesy and civility. Live it. Too often leaders talk about what’s required for the team to be successful but fail to hold themselves to the same standard. Leaders who truly live their values can expect those values to spread into every level of the organization. The best company cultures are built on a set of core values that every leader and employee knows and lives out. Appreciate it. Regardless of what sort of culture you want for your company, there has to be an element of appreciation and recognition for others. Recognition means people care about each other and are invested in each other’s success. They recognize and appreciate diversity. Embrace it. Embrace your organization’s culture by engaging in behaviors that support it. Too often, leaders focus on what’s not going right, which creates more of the same. Instead of placing attention on what’s wrong, focus on what’s right. Your organization’s culture is a reflection of its values. It is the voice of your business, and it takes you and each member of your team to ensure its success. Lead from within: When you provide an environment in which people enjoy spending time, they will not only do their job but will outperform themselves every day. 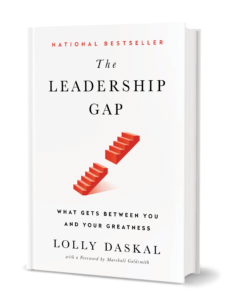 The post This is What Happens When You Build a Successful Culture appeared first on Lolly Daskal.